Portions of the interior walls upstairs communicated with the attic airspace, meaning that the only thing preventing heat leaking through those walls was a single layer of drywall. The basement was wet, drafty, and the unenclosed and ragged fiberglass insulation was unlikely to be performing well. The house was very leaky: a blower door test revealed a very high level of air exchange. Use heavy plastic, drainage channels, a sump pump and a dehumidifier to manage moisture in the basement. Correct the air leakage issues in the attic and add more insulation there. Replace various old, inefficient appliances with much more efficient modern equivalents. We don't have a final proposal yet, but I have an email outline and all this comes to around $19k depending on exactly what ends up being included. New York state has an on-bill recovery program that allows this to be financed with the payments being added to our utility bill. The idea is that the money saved in energy will more than offset the cost of the improvements so that our bill will go down despite the loan payments coming out of it. From the homeowner's perspective this sounds amazing: $20k of improvements to the house for negative money! However, I noted that once we agreed to the project, the loan payments would be absolutely definite, whereas, for the projected reductions in the energy bill, we were dependent on the contractor's estimates. While he seemed very much like an honest and decent guy, he is in business and thus did have a financial incentive to make the project happen. Since it's a large commitment I set out to build my own model of the thermal performance of our house in a spreadsheet to make sure I believed in the improvements. In this post I am going to outline this model for the house as it functions at present. Then in a second post I will take up what the proposed improvements might do, and how the finances might work out. I had thought this would be reasonably simple, but it turned out that initially the energy inflows and outflows were out of balance by a factor of two and I had to do a lot of further exploration to figure out why that might be. In this process, I was helped a lot by Steve Andrews who, in addition to being an ASPO-USA founder, was a green building consultant for many years. He reviewed my spreadsheet several times and made a number of helpful suggestions. I also discovered things about the house that I didn't know (like the 1/2" of styrofoam between the old clapboards and the vinyl siding on the house). The units here are millions of British Thermal Units summed over the six month heating season October-March. (I apologize to my European readers for the irrational units over here). The right column shows all the energy inputs I was able to document coming into the house. The major factors were the wood heat and electricity. However, although our house was not designed with passive solar heating in mind, it was necessary to account for solar gain through the windows to get close enough. I also worked out approximations for things like body heat (based on assuming 2/3 of dietary calories ended up as heat in the house) and solar gains through the walls, but those turned out to be relatively minor contributions. 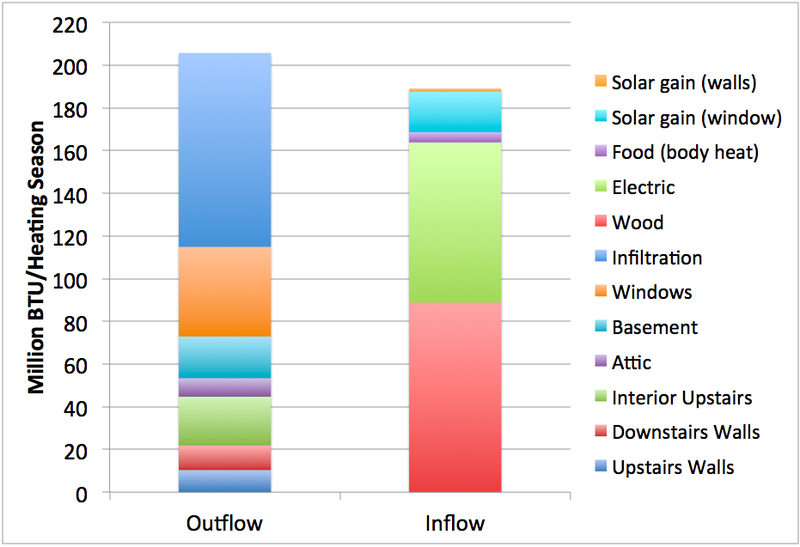 On the outflow side (the left column), the biggest single factor by far is the infiltration (heat lost by air flowing through the house because of all the leaks in it). The second biggest factor is conductive losses through the windows - mostly original single pane casements with triple track storm windows over them. Our energy auditor doesn't believe that replacing the windows would be cost-effective, but did recommend various simple things (like replacing missing clasps to hold the window panes tight to each other when closed). The next largest factor is the heat leakage through the upstairs interior walls into the attic (which is quite uncertain as I'll explain in a moment), and then heat conduction down into the basement. Conduction through the walls and the attic are amongst the smallest factors (because these are the issues that previous owners of the house had made effective efforts at solving). At this point, I'm going to make some notes about how to go about making this kind of calculation for the benefit of anyone who wants to do the same for their own home (or critique my approach). If you don't care for the technical details, you may want to skip these next bullet points. Wood - I knew how many cords I had bought and went out and measured the woodpile to figure out how much was left, then made allowance for the remainder of March. Then I used heat values for maple/beech (our main local species) from this Engineering Toolbox page, but corrected for our stove being rated as 75% efficient vs 65%. 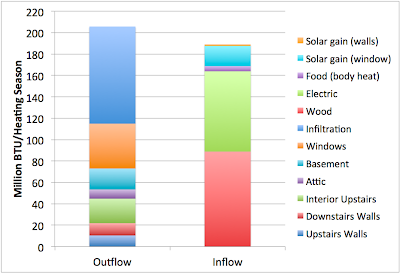 Electricity - I included the entire electric usage from the utility bills for the heating season. This is probably a decent approximation: in addition to the baseboard electric heat our house came with, most appliances - refrigerators, computers, stoves, etc - will end up with all their electricity usage being heat inside the building. The one partial exception is hot water, where some of the heat will end up in the basement or exiting the house via the drains - I didn't attempt to model that. Solar gain - I used this excellent online solar gain calculator, along with having measured the window area on each wall of the house. For infiltration, my auditor supplied me with a blower door measurement that at 50Pa pressure difference, the fan was pushing 5155 cubic feet per minute. One divides this by the "LBL number" to get an estimate of the natural rate air movement through the house - for a two story house in my area, the number is 15, so I get 345cfm as the estimated average air movement through the house. Next we need to know the heat capacity of that air which works out to 0.0262 btu per cubic foot per degree Fahrenheit. Multiply these two factors by a third: the number of minutes in a day and you get the number of BTU per "degree day". This is basically the amount of heat required to heat the outside air for a whole day by one degree F. Then you need the number of degree days (eg from a map like this) which in my climate is about 7000. That's it. Note that there is pretty much no way to get close on the infiltration heat loss without a blower door test of the house. Then there's the conductance loss through the various house elements. I started out with various crude approximations but had to refine them as I tried to get energy inflow and outflow on the house to balance. The most complex is the walls so let me illustrate with that. My walls consist of 1" hardwood paneling inside 3 1/2" studs with blown in cellulose in the cavities. Outside the studs is a layer of clapboards, then about half an inch of styrofoam, then vinyl siding that was installed over the clapboards by the previous owners. I estimate the R value of this assemblage at about 15 as follows: 0.5 for inner air boundary layer, 1 for the wood paneling, 0.75 for the clapboards, 2.5 for the styrofoam and an extra 0.5 for the still air in the clapboard/vinyl arrangement. Then then there's the stud/cellulose, which I estimate at a combined effective 10 (the cellulose is about 12.5 and the stud is about 3.5 and we have to add these in weighted reciprocal so 16/(1.5/3.5+14.5/12.5) (noting that these are 1.5" thick studs and are 16" on center). Then 10 + 2 x 0.5 + 2.5 + 1 + 0.75 = 15.25. On the downstairs, where the IR camera found some indication of settling and voidage in the cellulose, I took a 10% discount from this number. Once you have an R value, then the heat loss per degree day is given by 24*A/R where A is the area in square feet. Measure the area of the walls, subtract the area of the windows to be treated separately but similarly with their own R value, and then multiply by the number of heating degree days for your climate. The attic and basement are similar except that it's necessary to guesstimate how effective the ragged unenclosed fiberglass in the basement really is. I gave my floor assemblage credit for R-6. Finally, I had an unknown fraction of the interior upstairs walls in thermal communication with the attic. I guesstimated about 1/4 of the wall surface area was effectively in that state, and assumed an R value of 2 for that area (under Steve's guidance - the air layers next to the drywall need to be counted not just the R of the drywall itself or this heat loss will be overestimated). Clearly - there are a lot of things here that are not known precisely. There's no way to be certain about that upstairs interior wall loss, the exact efficiency of our stove, the exact microclimate at our hill farm elevation, etc. But I felt this model was good enough to be useful for making estimates of the likely effect of the work. I will take that up in a second post shortly. I haven't even read very far into this yet, but your comment about plastic for managing moisture made me stop and comment. As part of my basement heat and moisture remediation, I am completing my concrete floor as half the basement right now is dirt. In preparation, I did a quick radon test on the house and found a pretty high 10.0 piC/ltr. reading. I will be installing some under slab venting as a result. If you haven't done a radon test on your house yet, you probably should. It seemed that I had more than water vapor coming up out of the basement soil and a few utility holes in the foundation. In our area, radon tests are a mandatory part of the real estate transaction process. Ours came out pretty good. In a lot of ways older houses are built much better than newer ones. But from an energy efficiency standpoint there is usually a limit to what you can do with an older house. Just as a thought exercise, if you didn't have an existing house, what kind of home would you build? And counting what you are going to spend on the existing house, how many years would you have to live in a new one to make it pay? I don't mean this as facetiously as it sounds. If you plan to be in this house 30 or 40 years, it might be wiser to build a new one if you can afford it. Down where I live, winters are so mild that we can get away with a lot of stuff (roofs, insulation, pvc plumbing, etc) that you couldn't possibly do. The kind of older house I'm thinking of was usually manufactured before widespread air conditioning, so it is much easier to live in one without ac. And winters just aren't as dire as what you are looking at. Depending on how easy it would be to make energy improvements, if I moved to Wisconsin or someplace with real winters I think I would lean to a new house. I'm also surprised the guy didn't think the new efficient windows would make a big difference. In my experience they make a big difference from the old single pane. I've also read some things here and there about making your own "window covers" for use in winter. Maybe old news to you, but it might be worth looking into for you, particularly in rooms you don't go in very much. See the posts on Straw bale for what kind of new house I'd build. Now we like this one enough that we'll mostly likely extend it at some point rather than build a new structure. On windows - he didn't say it wouldn't make a difference but rather that the cost of replacing all the windows would not pay for itself in any reasonable time frame. It seems to me that inflows are probably an easier, and possibly more accurate, measure for most people. If one calculates inflows first, then calculates all the outflows except infiltration, it would probably be a reasonable approximation to simply set the infiltration value such that the two flows are equal (or one could build in some small fudge factor here). While less accurate than the blower door, this method seems like it would get you in the same ballpark and it would be cheaper. Brian: I think the problem there would be that there's no way to distinguish between "infiltration" and "other issues I can't easily detect" - for example my upstairs walls that communicate with the attic. Large amounts of missing insulation in walls comes to mind as another possibility. My experience of this process is it really is pretty hard to do a good job at this stuff without the input of a professional with the right tools. There's certainly plenty of stuff one can detect and fix with nothing more than an incense stick and a visual inspection, but there's no easy way to tell whether one is missing the really big issues that way. I wouldn't worry too much about second guessing his estimate. It is extremely common to save vast amounts of money doing the sorts of things he recommends, to the point where McKinsey & Co call energy efficiency the low hanging fruit, where Passiv Haus design (essentially insulation/with incoming fresh air heated by outgoing warm stale air) can lead to zero costs for energy, and there are just so many examples - it is the rule, not the exception.